For other people named Clark Smith, see Clark Smith (disambiguation). George Sterling was an American poet and playwright based in California who, during his lifetime, was celebrated on the Pacific coast as one of the great American poets, although he never gained equivalent success in the rest of the United States. Smith was one of "the big three of Weird Tales , with Robert E. Howard and H. P. Lovecraft",  but some readers objected to his morbidness and violation of pulp traditions. The fantasy critic L. Sprague de Camp said of him that "nobody since Poe has so loved a well-rotted corpse." Smith was a member of the Lovecraft circle and his literary friendship with Lovecraft lasted from 1922 until Lovecraft's death in 1937. His work is marked by an extraordinarily rich and ornate vocabulary, a cosmic perspective and a vein of sardonic and sometimes ribald humor. 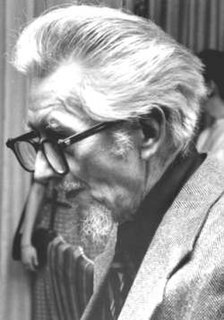 Lyon Sprague de Camp, better known as L. Sprague de Camp, was an American writer of science fiction, fantasy and non-fiction. In a career spanning 60 years, he wrote over 100 books, including novels and works of non-fiction, including biographies of other fantasy authors. He was a major figure in science fiction in the 1930s and 1940s. Smith was born January 13, 1893, in Long Valley, California, of English and New England parentage. He spent most of his life in the small town of Auburn, California, living in a cabin built by his parents, Fanny and Timeus Smith. Smith professed to hate the town's provincialism but rarely left it until he married late in life. Agoraphobia is an anxiety disorder characterized by symptoms of anxiety in situations where the person perceives their environment to be unsafe with no easy way to escape. These situations can include open spaces, public transit, shopping centers, or simply being outside their home. Being in these situations may result in a panic attack. The symptoms occur nearly every time the situation is encountered and last for more than six months. Those affected will go to great lengths to avoid these situations. In severe cases people may become completely unable to leave their homes. Eidetic memory is an ability to recall images from memory vividly after only a few instances of exposure, with high precision for a brief time after exposure, without using a mnemonic device. Although the terms eidetic memory and photographic memory are popularly used interchangeably, they are also distinguished, with eidetic memory referring to the ability to view memories like photographs for a few minutes, and photographic memory referring to the ability to recall pages of text or numbers, or similar, in great detail. When the concepts are distinguished, eidetic memory is reported to occur in a small number of children and as something generally not found in adults, while true photographic memory has never been demonstrated to exist. Robinson Crusoe is a novel by Daniel Defoe, first published on 25 April 1719. The first edition credited the work's protagonist Robinson Crusoe as its author, leading many readers to believe he was a real person and the book a travelogue of true incidents. The other main course in Smith's self-education was to read the complete 11th edition of the Encyclopædia Britannica at least twice. Smith later taught himself French and Spanish in order to translate verse out of those languages, including works by Gérard de Nerval, Paul Verlaine, and all but 6 of Charles Baudelaire's 157 poems in The Flowers of Evil . The Encyclopædia Britannica, Eleventh Edition (1910–11) is a 29-volume reference work, an edition of the Encyclopædia Britannica. It was developed during the encyclopaedia's transition from a British to an American publication. Some of its articles were written by the best-known scholars of the time. This edition of the encyclopedia, containing 40,000 entries, is now in the public domain, and many of its articles have been used as a basis for articles in Wikipedia. However, the outdated nature of some of its content makes its use as a source for modern scholarship problematic. Some articles have special value and interest to modern scholars as cultural artifacts of the 19th and early 20th centuries. Gérard de Nerval was the nom-de-plume of the French writer, poet, and translator Gérard Labrunie, a major figure of French romanticism, best known for his novellas and poems, especially the collection Les Filles du feu, which included the novella Sylvie and the poem "El Desdichado". He played a major role in introducing French readers to the works of German Romantic authors, including Klopstock, Schiller, Bürger and Goethe. His later work merged poetry and journalism in a fictional context and influenced Marcel Proust. His last novella, Aurélia, influenced André Breton and Surrealism. His first literary efforts, at the age of 11, took the form of fairy tales and imitations of the Arabian Nights. Later, he wrote long adventure novels dealing with Oriental life. By 14 he had already written a short adventure novel called The Black Diamonds which was lost for years until published in 2002. Another juvenile novel was written in his teenaged years— The Sword of Zagan (unpublished until 2004). Like The Black Diamonds, it uses a medieval, Arabian Nights-like setting, and the Arabian Nights, like the fairy tales of the Brothers Grimm and the works of Edgar Allan Poe, are known to have strongly influenced Smith's early writing, as did William Beckford's Vathek . At age 17, he sold several tales to The Black Cat , a magazine which specialized in unusual tales. He also published some tales in the Overland Monthly in this brief foray into fiction which preceded his poetic career. He became Sterling's protégé and Sterling helped him to publish his first volume of poems, The Star-Treader and Other Poems , at the age of 19. Smith received international acclaim for the collection. The Star-Treader was received very favorably by American critics, one of whom named Smith "the Keats of the Pacific". Smith briefly moved among the circle that included Ambrose Bierce and Jack London, but his early fame soon faded away. One of Smith's artistic patrons and frequent correspondents was San Francisco businessman Albert M. Bender. He published at his own expense a volume containing six of his best stories, The Double Shadow and Other Fantasies, in an edition of 1000 copies printed by the Auburn Journal. The theme of much of his work is egotism and its supernatural punishment; his weird fiction is generally macabre in subject matter, gloatingly preoccupied with images of death, decay and abnormality. Most of Smith's weird fiction falls into four series set variously in Hyperborea, Poseidonis, Averoigne and Zothique. Hyperborea, which is a lost continent of the Miocene period, and Poseidonis, which is a remnant of Atlantis, are much the same, with a magical culture characterized by bizarreness, cruelty, death and postmortem horrors. Averoigne is Smith's version of pre-modern France, comparable to James Branch Cabell's Poictesme. Zothique exists millions of years in the future. It is "the last continent of earth, when the sun is dim and tarnished". These tales have been compared to the Dying Earth sequence of Jack Vance. In 1933 Smith began corresponding with Robert E. Howard, the Texan creator of Conan the Barbarian. 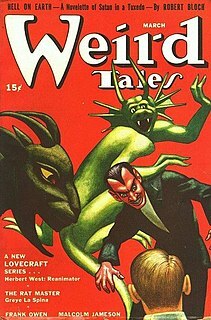 From 1933 to 1936, Smith, Howard and Lovecraft were the leaders of the Weird Tales school of fiction and corresponded frequently, although they never met. The writer of oriental fantasies E. Hoffmann Price is the only man known to have met all three in the flesh. In September 1935, Smith's mother Fanny died. Smith spent the next two years nursing his father through his last illness. Timeus died in December 1937. Aged 44, Smith now virtually ceased writing fiction. He had been severely affected by several tragedies occurring in a short period of time: Robert E. Howard's death by suicide (1936), Lovecraft's death from cancer (1937) and the deaths of his parents, which left him exhausted. As a result, he withdrew from the scene, marking the end of Weird Tales' Golden Age. He began sculpting and resumed the writing of poetry. However, Smith was visited by many writers at his cabin, including Fritz Leiber, Rah Hoffman, Francis T. Laney and others. In 1942, three years after August Derleth founded Arkham House for the purpose of preserving the work of H.P. Lovecraft, Derleth published the first of several major collections of Smith's fiction, Out of Space and Time (1942). This was followed by Lost Worlds (1944). The books sold slowly, went out of print and became costly rarities. Derleth published five more volumes of Smith's prose and two of his verse, and at his death in 1971 had a large volume of Smith's poems in press. In 1953 Smith suffered a coronary attack. Aged 61, he married Carol(yn) Jones Dorman on November 10, 1954. Dorman had much experience in Hollywood and radio public relations. After honeymooning at the Smith cabin, they moved to Pacific Grove, California, where he set up a household including her three children. (Carol had been married before). For several years he alternated between the house on Indian Ridge and their house in Pacific Grove. Smith having sold most of his father's tract, in 1957 the old house burned — the Smiths believed by arson, others said by accident. Smith now reluctantly did gardening for other residents at Pacific Grove, and grew a goatee. He spent much time shopping and walking near the seafront but despite Derleth's badgering, resisted the writing of more fiction. In 1961 he suffered a series of strokes and, that August, he quietly died in his sleep, aged 68. After Smith's death Carol remarried (becoming Carolyn Wakefield) and subsequently died of cancer. Bookseller Roy A. Squires was appointed Smith's "west coast executor", with Jack L. Chalker as his "east coast executor". Squires published many letterpress editions of individual Smith poems. Smith's literary estate is represented by his stepson, Prof William Dorman, director of CASiana Literary Enterprises. Arkham House owns the copyright to many Smith stories, though some are now in the public domain. For 'posthumous collaborations' of Smith (stories completed by Lin Carter), see the entry on Lin Carter. While Smith was always an artist who worked in several very different media, it is possible to identify three distinct periods in which one form of art had precedence over the others. Smith published most of his volumes of poetry in this period, including the aforementioned The Star-Treader and Other Poems , as well as Odes and Sonnets (1918), Ebony and Crystal (1922) and Sandalwood (1925). His long poem The Hashish-Eater; Or, the Apocalypse of Evil was written in 1920. "The Hunters from Beyond", one of Clark Ashton Smith's best-known stories, was first published in the October 1932 issue of Strange Tales . Smith wrote most of his weird fiction and Cthulhu Mythos stories, partially inspired by H. P. Lovecraft. Creatures of his invention include Aforgomon, Rlim-Shaikorth, Mordiggian, Tsathoggua, the wizard Eibon, and various others. In an homage to his friend, Lovecraft referred in "The Whisperer in Darkness" and "The Battle That Ended the Century" (written in collaboration with R. H. Barlow) to an Atlantean high-priest, "Klarkash-Ton." Smith's weird stories form several cycles, called after the lands in which they are set: Averoigne, Hyperborea, Mars, Poseidonis, Zothique. To some extent Smith was influenced in his vision of such lost worlds by the teachings of Theosophy and the writings of Helena Blavatsky. Stories set in Zothique belong to the Dying Earth subgenre. Amongst Smith's science fiction tales are stories set on Mars and the invented planet of Xiccarph. His short stories originally appeared in the magazines Weird Tales , Strange Tales , Astounding Stories , Stirring Science Stories and Wonder Stories . Clark Ashton Smith was the third member of the great triumvirate of Weird Tales, with Lovecraft and Robert E. Howard. Many of Smith's stories were published in six hardcover volumes by August Derleth under his Arkham House imprint. For a full bibliography to 1978, see Sidney-Fryer, Emperor of Dreams (cited below). S.T. Joshi is working with other scholars to produce an updated bibliography of Smith's work. 1912: The Star-Treader and Other Poems. San Francisco: A.M. Robertson, Nov 1912. 100 pages. 2000 copies. Some copies have a frontispiece photo by Bianca Conti; others lack it. 1918: Odes and Sonnets. San Francisco: The Book Club of California, June 1918. 28 pages. 300 copies. 1922: Ebony and Crystal: Poems in Verse and Prose. Auburn CA: The Auburn Journal Press, Oct 1925. 43 pages. Limited to 500 copies signed by Smith. Some copies are found with corrections in Smith's hand to typos in the text. 1925: Sandalwood. Auburn CA: The Auburn Journal Press, Oct 1925. Verse. 43 pages. Limited to 250 (i.e. 225)numbered copies signed by Smith. Some copies are found with corrections in Smith's hand to typos in the text. 1933: The Double Shadow and Other Fantasies. Auburn, CA: The Auburn Journal Press, 1933. Short stories. Limited to 1000 copies in grey paper wrappers. 1937: Nero and Other Poems. Lakeport CA: The Futile Press, May 1937. 24 pages. c.250 copies. Complete copies have laid in the three page essay "The Price of Poetry", on Smith's verse, by David Warren Ryder, which was printed to accompany the book. 1951: The Dark Chateau and Other Poems. Sauk City, WI: Arkham House, Dec 1951. 63 pages. 563 copies. 1958: Spells and Philtres. Sauk City: Arkham House, March 1958. Verse. 54 pages. 519 copies. 1962: The Hill of Dionysus – A Selection. Pacific Grove, CA: Roy A. Squires and Clyde Beck. Verse. This volume was prepared while Smith was still living but he died before it could see print. It was published 'In memoriam'. 1971: Selected Poems. Sauk City, WI: Arkham House, Nov 1971. This volume was delivered by the author to Arkham House in December 1949 but remained unpublished until 1971. Miscellaneous Writings. Originally announced as Tales of India and Irony (a collection of non-fantasy/science fiction/horror tales, planned to be available only to subscribers of above collection). Now commercially available. The Black Diamonds. A juvenile Oriental fantasy. The Sword of Zagan and Other Writings. Juvenile Oriental fantasy. Shadows Seen and Unseen: Poetry from the Shadows. San Jose, CA: Hih Art Studios, 2007. Edited by Raymond L. Johnson and Ardath W. Winterowd and signed by both editors. Limited to 540 copies. Hardcover in slipcase. Includes reproductions of poetry mansuscripts by Smith, and color plates of several Smith paintings. The Dark Eidolon and Other Fantasies. Ed, S. T. Joshi. 2014. Smith, Clark Ashton. Planets and Dimensions: Collected Essays. Edited by Charles K. Wolfe. Baltimore MD: Mirage Press, 1973. Emperor of Dreams . Ed, Stephen Jones. Gollancz, 2002. An omnibus edition in paperback of Smith's best tales. In the Line of the Grotesque and Monstrous. Introduction by D.S. Black. Berkeley: The Bancroft Library, 2004. Prints the text of three letters by Smith to Samuel Loveman. 50 copies only printed, in burnt orange wrappers. Printed on the Bancroft library's 1856 Albion handpress. The Black Abbot of Puthuum. Glendale, CA: The RAS Press, Oct 2007. Limited to 250 numbered copies. Roy A. Squires, bookman and letterpress printer, issued many limited edition pamphlets consisting of individual Smith poems and prose poems. Scholars S.T. Joshi and David E. Schultz are preparing various volumes of Smith's letters to such of his individual correspondents as Donald Wandrei, Robert H. Barlow, and August Derleth. Clark Ashton Smith: Live from Auburn: The Elder Tapes. In the late 1950s Smith recorded a number of his poems on the taperecorder of his friend Robert B. Elder. Elder chose the 11 poems at random from Smith's books The Dark Chateau and "Spells and Philtres". (Elder had first met Smith when reporting on his 1954 wedding to the former Carol Dorman for The Auburn Courier and they became friends when Smith praised Elder's novel Whom the Gods Destroy.) In 1995 Necronomicon Press released the audiocassette Clark Ashton Smith: Live from Auburn: The Elder Tapes, which includes an introduction by Elder and then Smith reading his poems. The recording was produced by Wayne Haigh. The cassette was accompanied by a booklet featuring a c.1960 photo of Smith and reprints all 11 poems. Gahan Wilson provided the cover art for cassette and booklet. The recording has not been released on CD. "The Return of the Sorcerer" was adapted for an episode of the television series Night Gallery , starring Vincent Price and Bill Bixby. "The Seed from the Sepulcher", "The Vaults of Yoh Vombis" and "The Return of the Sorcerer" were adapted as ten-page comics by Richard Corben, published in DenSaga 1, 2 and 3 respectively (Fantagor Press 1992–1993). "Mother of Toads" was adapted as segment one of the six-segment horror anthology film The Theatre Bizarre (2011). Wikimedia Commons has media related to Clark Ashton Smith . ↑ Michael Dirda, "A Journey to the Fantastic Realms of Clark Ashton Smith". The Washington Post , February 18, 2007. Retrieved January 28, 2019. ↑ Thomas, G. W. "A Reader's Guide to Sword & Sorcery S-V". Archived from the original on May 28, 2010. Retrieved September 27, 2012. ↑ "Introduction to 'Tales of Zothique' by Will Murray". www.eldritchdark.com. ↑ Smith, Clark Ashton (1922). Ebony and Crystal: Poems in Verse and Prose. Auburn, California. ↑ Steve Behrends. "The Song of the Necromancer: 'Loss' in Clark Ashton Smith's Fiction". Studies in Weird Fiction 1, No 1 (Summer 1986), 3–12. ↑ "Clark Ashton Smith: The Sorcerer of Auburn". alangullette.com. ↑ Harvey, Ryan (April 9, 2008). "The Fantasy Cycles of Clark Ashton Smith PART III: Tales of Zothique". Black Gate . Retrieved September 16, 2013. ↑ Many examples are reproduced in Dennis Rickard (1973). The Fantastic Art of Clark Ashton Smith. Baltimore: The Mirage Press. ↑ "Gallery of Art by Clark Ashton Smith". December 30, 2009. Retrieved October 29, 2012. Averoigne is a fictional counterpart of a historical province in France, detailed in a series of short stories by the American writer Clark Ashton Smith. Smith may have based Averoigne on the actual province of Auvergne, but its name was probably influenced by the French department of Aveyron, immediately south of Auvergne, due to the similarity in pronunciation. The Emperor of Dreams is a collection of American fantasy author and poet Clark Ashton Smith's short tales arranged in chronological order. It was published by Gollancz in 2002 as the 26th volume of their Fantasy Masterworks series. The collection contains stories from Smith's major story cycles of Averoigne, Hyperborea, Poseidonis, and Zothique. Most of the stories originally appeared in the magazines The Fantasy Fan, Weird Tales, Overland Monthly, Strange Tales of Mystery and Terror, The Magic Carpet/Oriental Stories, The Auburn Journal, Stirring Science Stories, The Arkham Sampler, Saturn and Fantastic Universe. Beyond the Wall of Sleep is a collection of fantasy, horror and science fiction short stories, poems and essays by American author H. P. Lovecraft. It was released in 1943 and was the second collection of Lovecraft's work published by Arkham House. 1,217 copies were printed. The volume is named for the Lovecraft short story "Beyond the Wall of Sleep". Marginalia is a collection of Fantasy, Horror and Science fiction short stories, essays, biography and poetry by and about the American author H. P. Lovecraft. It was released in 1944 and was the third collection of Lovecraft's work published by Arkham House. 2,035 copies were printed. Out of Space and Time is a collection of fantasy, horror and science fiction short stories by American writer Clark Ashton Smith. It was released in 1942 and was the third book published by Arkham House. 1,054 copies were printed. A British hardcover appeared from Neville Spearman in 1971, with a two-volume paperback reprint following from Panther Books in 1974. Bison Books issued a trade paperback edition in 2006. Lost Worlds is a collection of fantasy, horror and science fiction short stories by American writer Clark Ashton Smith. It was released in 1944 and was the author's second book published by Arkham House. 2,043 copies were printed. Genius Loci and Other Tales is a collection of fantasy, horror and science fiction short stories by American writer Clark Ashton Smith. It was released in 1948 and was the author's third book published by Arkham House. It was released in an edition of 3,047 copies. The stories were written between 1930 and 1935. The Dark Chateau is a collection of poems by American writer Clark Ashton Smith. It was released in 1951 and was the author's fourth book to be published by Arkham House. It was released in an edition of 563 copies. The book was intended to be a stop-gap volume representing Smith's poetry while the more extensive Selected Poems was being prepared, although Selected Poems did not ultimately appear until 1971. The Abominations of Yondo is a collection of fantasy, horror and science fiction short stories by American writer Clark Ashton Smith. It was released in 1960 and was the author's fourth collection of stories published by Arkham House. It was released in an edition of 2,005 copies. The stories were mostly written between 1930 and 1935. Tales of Science and Sorcery is a collection of stories by American writer Clark Ashton Smith. It was released in 1964 and was the author's fifth collection of stories published by Arkham House. It was released in an edition of 2,482 copies. The stories were originally published between 1930 and 1958 in Weird Tales and other pulp magazines. The Arkham Collector was an American fantasy, horror fiction and poetry magazine first published in Summer 1967. The magazine, edited by August Derleth, was the second of two magazines published by Arkham House, the other being the Arkham Sampler. Each issue of The Arkham Collector had an approximate print run of 2,500 copies. Its headquarters was in Sauk City, Wisconsin. Mary Elizabeth Counselman was an American writer of short stories and poetry. A Rendezvous in Averoigne is a collection of science fiction, fantasy and horror stories by American writer Clark Ashton Smith. It was released in 1988 by Arkham House in an edition of 5,025 copies. The collection contains stories from Smith's major story cycles of Averoigne, Hyperborea, Poseidonis, Xiccarph, and Zothique. Its title story is a relatively conventional vampire story. Lovecraft Remembered is a collection of memoirs about American writer H. P. Lovecraft, edited by Peter Cannon. It was released in 1998 by Arkham House in an edition of 3,579 copies. Nearly all the memoirs from previous Arkham publications of Lovecraft miscellany are included. De Camp, L. Sprague (1976). "Sierran Shaman: Clark Ashton Smith". Literary Swordsmen and Sorcerers: the Makers of Heroic Fantasy. Arkham House. ISBN 0-87054-076-9. Herron, Don. "Collecting Clark Ashton Smith". Firsts (October 2000). Joshi, S. T. (2008). "Clark Ashton Smith: Beauty Is for the Few," chapter 2 in Emperors of Dreams: Some Notes on Weird Poetry. Sydney: P’rea Press. ISBN 978-0-9804625-3-1 (pbk) and ISBN 978-0-9804625-4-8 (hbk). Murray, Will. "The Clark Ashton Smythos" in Price, Robert M. (ed). The Horror of it All: Encrusted gems from the Crypt of Cthulhu. Mercer Island WA: Starmont House, 1990. ISBN 1-55742-122-6. Behrends, Steve. Clark Ashton Smith. Starmont Reader's Guide 49. Mercer Island, WA: Starmont House, 1990. Cockcroft, Thomas G.L. The Tales of Clark Ashton Smith: A Bibliography. Lower Hutt, New Zealand: Cockcroft, Nov 1961 (500 copies). The first published bibliography on Smith; superseded by Donald Sidney-Fryer's Emperor of Dreams (1978) – see below. Connors, Scott. The Freedom of Fantastic Things: Selected Criticism on Clark Ashton Smith. NY: Hippocampus Press, 2006.
de Camp, L. Sprague. "Sierra Shaman: Clark Ashton Smith," in Literary Swordsmen and Sorcerers: The Makers of Heroic Fantasy. Sauk City,. WI: Arkham House, 1976, 211-12. Fait, Eleanor. "Auburn Artist-Poet Utilizes Native Rock in Sculptures.". Sacramento Union (21 Dec 1941), 4C. Haefele, John D. "Far from Time: Clark Ashton Smith, August Derleth, and Arkham House." Weird Fiction Review No 1 (Fall 2010), 154–189. Hilger, Ronald. One Hundred Years of Klarkash-Ton. Averon Press, 1996. Klarkash-Ton: The Journal of Smith Studies No 1 (June 1988), Cryptic Publications. Edited by Steve Behrends. This journal was continued under a new title but with the numbering continued from No 1, thus the first issue of The Dark Eidolon: The Journal of Smith Studies, (Necronomicon Press) is numbered "2" (it appeared June 1989). There were only 3 issues in total. No 3 appeared in Dec 2002. Lost Worlds: The Journal of Clark Ashton Smith Studies , Seele Brennt Publications. Edited by Smith's biographer Scott Connors and Ronald S. Hilger. Issued annually, five numbers 2003–2008. Schultz, David E. and Scott Connors (ed). Selected Letters of Clark Ashton Smith. Sauk City, WI: Arkham House, 2003. Schultz, David E and S.T. Joshi. The Shadow of the Unattained: The Letters of George Sterling and Clark Ashton Smith. NY: Hippocampus Press, 2005. Sidney-Fryer, Donald. Emperor of Dreams: A Clark Ashton Smith Bibliography. West Kingston, RI: Donald M. Grant Publishers, 1978. A substantial work of scholarship but now over thirty years out of date. A quantity of more recent bibliographical information can be found at the Bibliography section of the Eldritch Dark site online (see External Links). Sidney-Fryer, Donald. The Last of the Great Romantic Poets. Albuquerque NM: Silver Scarab Press, 1973. Sidney-Fryer, Donald. Clark Ashton Smith: The Sorcerer Departs. West Hills, CA: Tsathoggua Press, Jan 1997. Dole: Silver Key Press, 2007. Updated/revised version of his essay in the Special CAS Issue of Nyctalops (see above under Morris). The Eldritch Dark – This website contains almost all of Clark Ashton Smith's written work, as well as a comprehensive selection of his art, biographies, a bibliography, a discussion board, readings, fiction tributes and more. Eldonejo ‘Mistera Sturno’ – A growing collection of authorized translations into Esperanto for free distribution as ebooks. Clark Ashton Smith: Poems – A collection of Clark Ashton Smith's early poetry. "The Tale of Satampra Zeiros"